In American popular culture, Marilyn Monroe(1926-1962) has evolved in stature from movie superstar to American icon. 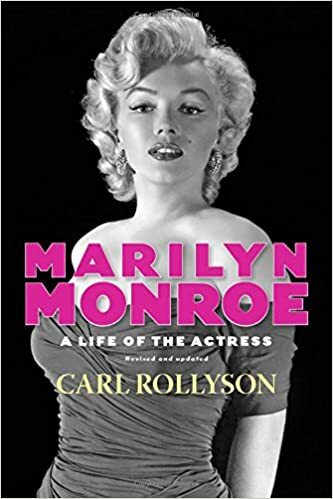 Monroe’s own understanding of her place in the American imagination and her effort to perfect her talent as an actress are explored with great sensitivity in Carl Rollyson’s engaging narrative. He shows how movies became crucial events in the shaping of Monroe’s identity. He regards her enduring gifts as a creative artist, discussing how her smaller roles in The Asphalt Jungle and All About Eve established the context for her career, while in-depth chapters on her more important roles in Bus Stop, Some Like It Hot, and The Misfits provide the centerpiece of his examination of her life and career. Through extensive interviews with many of Monroe’s colleagues, close friends, and other biographers, and a careful rethinking of the literature written about her, Rollyson is able to describe her use of Method acting and her studies with Michael Chekhov and Lee Strasberg, head of the Actors’ Studio in New York. The author also analyzes several of Monroe’s own drawings, diary notes, and letters that have recently become available. With over thirty black and white photographs (some published for the first time), a new foreword, and a new afterword, this volume brings Rollyson’s 1986 book up to date.